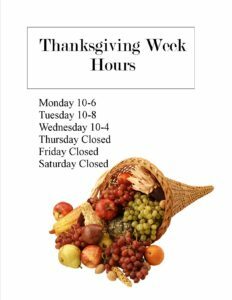 The library will be open regular hours on Monday, Tuesday and Wednesday and will be closed Thursday, Friday and Saturday this week due to the Thanksgiving Holiday. Don’t forget that the online catalog, Overdrive, Tumblebooks, and Hoopla are available at any time, even when the library is closed. The staff at the library wishes everyone a Happy Thanksgiving! previous post: Welcome to the new and improved Carver Public Library website!